Heat oven to 375°F. Line large cookie sheet with cooking parchment paper; set aside. Cut each sweet pepper in half lengthwise, leaving stems intact. Remove seeds and membranes. Place halved sweet peppers on cookie sheet, cut sides up. In medium bowl, mix refried beans, cheese, sour cream and taco seasoning mix until well mixed. Place mixture in resealable food-storage plastic bag. Cut 1/2 inch off 1 corner of bag. Pipe mixture into pepper halves. Top each pepper half with crushed corn chips. 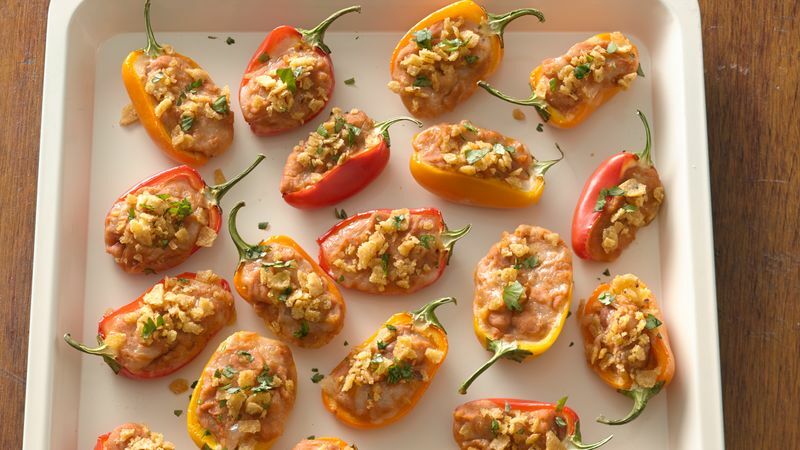 Bake 15 to 20 minutes or until peppers are crisp-tender. Cool on cookie sheet 10 minutes. Top with chopped fresh cilantro. Take these over the top by sprinkling a couple pieces of crisply cooked bacon on top of the peppers along with the corn chips. To make ahead, make as directed through step 3. Cover with plastic wrap, and refrigerate up to 6 hours until ready to bake. Top with corn chips, and bake as directed.